The first page of Bostan. Bustan (or Bostan Persian: بوستان‎‎, pronounced "Bustān" ) is a book of poetry by the Persian poet Saadi, completed in 1257 and dedicated to the Salghurid Atabeg Sa'd I or Sa'd II. It was Saadi's first work, and its title means "the orchard". The book contains the fruits of Saadi's long experience and his judgements upon life, and is illustrated by a vast collection of anecdotes. It includes accounts of Saadi's travels and his analysis of human psychology. He often mentions his accounts with fervour and advice similar to Aesop's fables. It is composed in mathnawī style (rhyming couplets), and has been translated into English. ↑ This manuscript may have been produced in India during the 17th century. The page provides a praise of God as an appropriate incipit to the text. The first two lines read: "In the name of the Lord, Life-Creating, / The Wise One, Speech-Creating with the Tongue, / The Lord, the Giver, the Hand-Seizing, / Merciful, Sin-Forgiving, Excuse-Accepting." 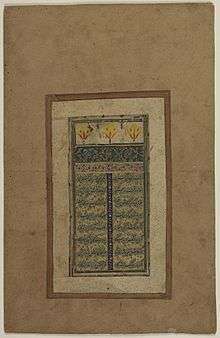 This page is typical of the first page of Persian poetical texts, with an ornamental panel at the top (sarloh) and the main text decorated by cloud band motifs and decorative illumination between the text and in the gutter separating each verse of poetry. ↑ C.E. Bosworth, The New Islamic Dynasties, (Columbia University Press, 1996), 207. Wikimedia Commons has media related to Bostan. This article is issued from Wikipedia - version of the 1/21/2015. The text is available under the Creative Commons Attribution/Share Alike but additional terms may apply for the media files.